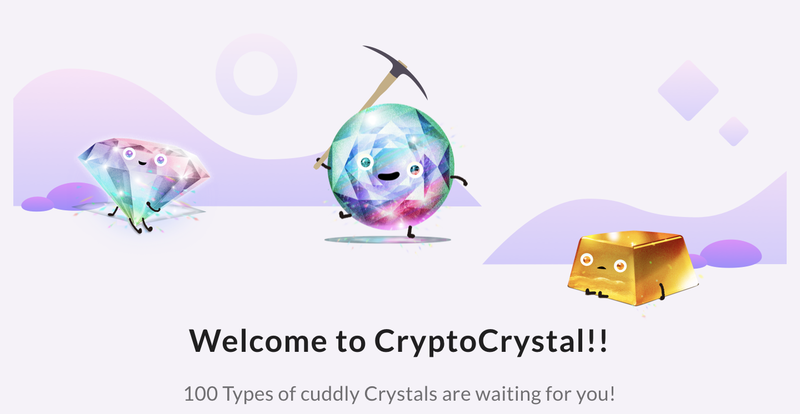 Finally, we’ve launched CryptoCrystal on 11th May 2018(5:00 UTC). 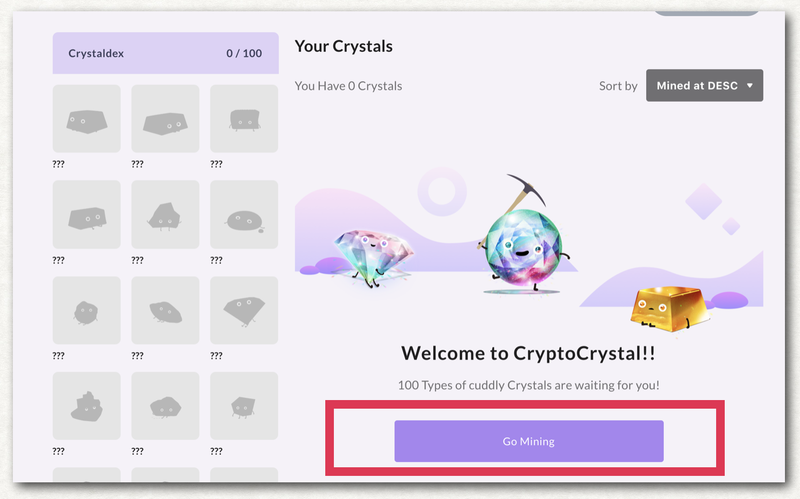 So today, we would like to introduce the tutorial of CryptoCrystal. 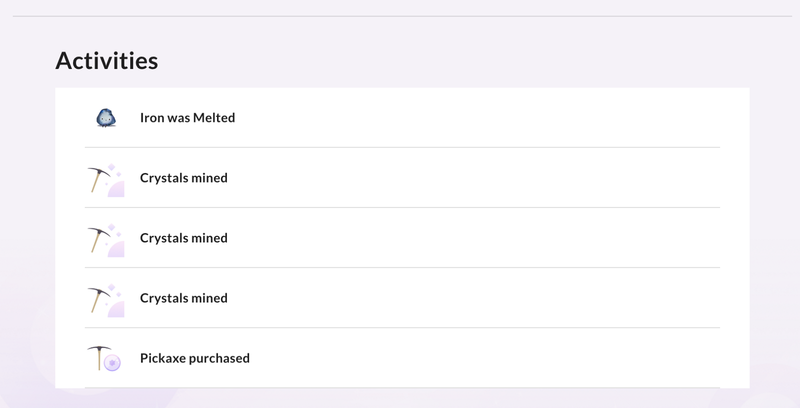 Before you play CryptoCrystal, you will need to install MetaMask, a digital ethereum wallet. You will need to put Eth in it. *Note: MetaMask acts like a bank account — treat it with respect and make sure you don’t forget your password or the seed words. 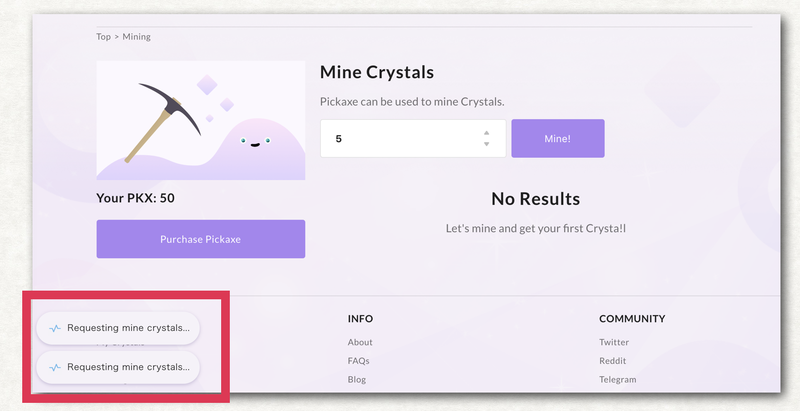 To play CryptoCrystal, you first need “Pickaxe Token (Pkx)”. 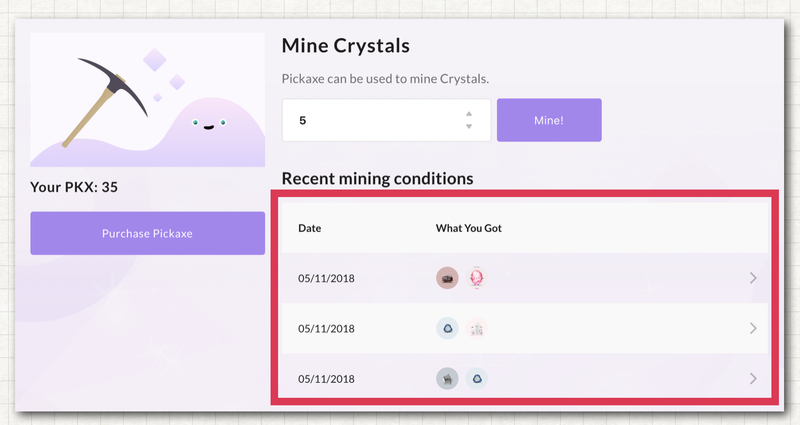 Without Pkx, you can’t mine anything in the world of Crypto Crystal, so, make sure you all got Pkx before going to mining. 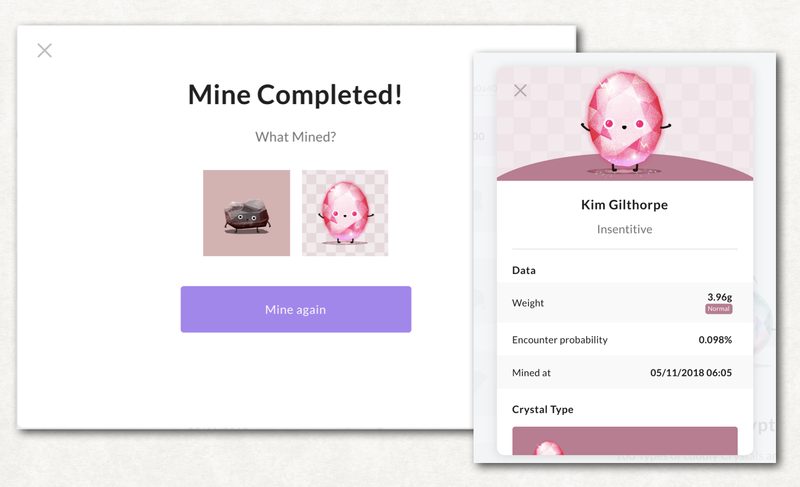 In the mining page, you can buy Pkx and mine the crystal. Step 2.2 — How and Where to buy the pkx? 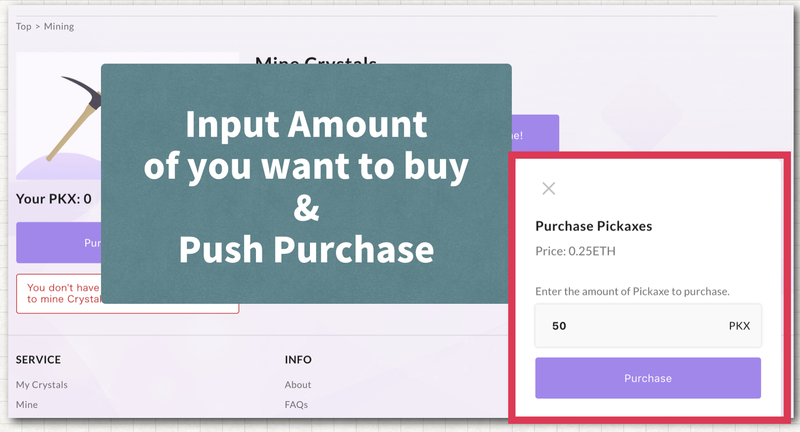 You can purchase your pkx in “Mining” page. 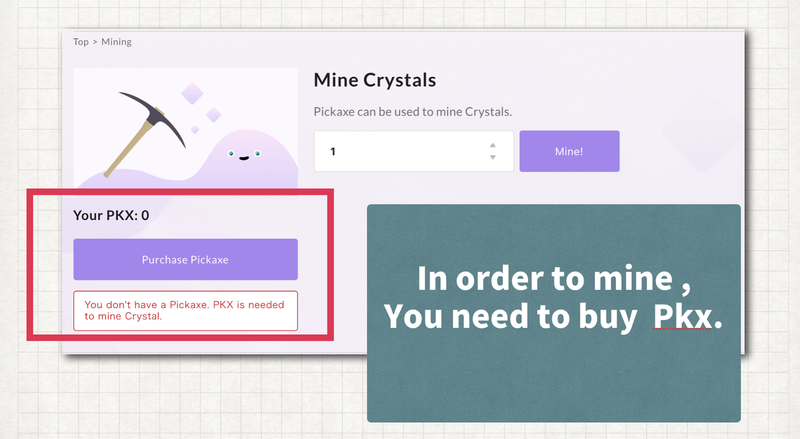 When you go to Mining page, tap on a button “Purchase Pickaxe“ which is shown in below image. Please input the amount of pkx you want to buy. How much do you want to buy ? OMG 100000? it is useless. please buy the amount to use. Let’s push the Mine button. Yes, Push it Push it! 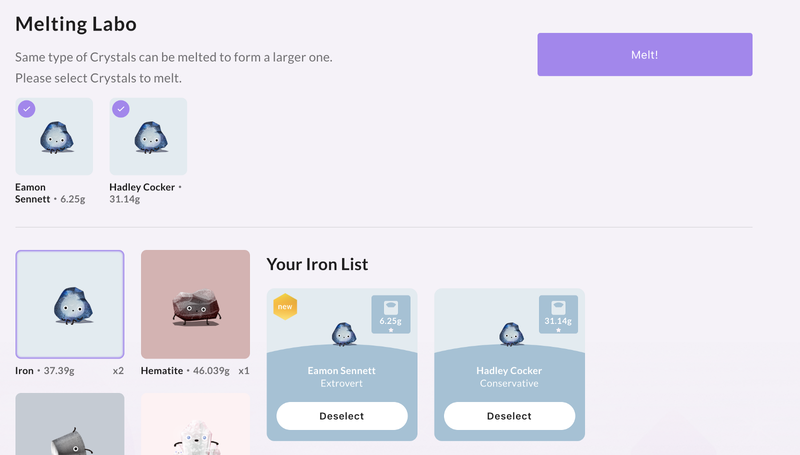 The popup of metamask is launched. You can set the gas limit and gas price. 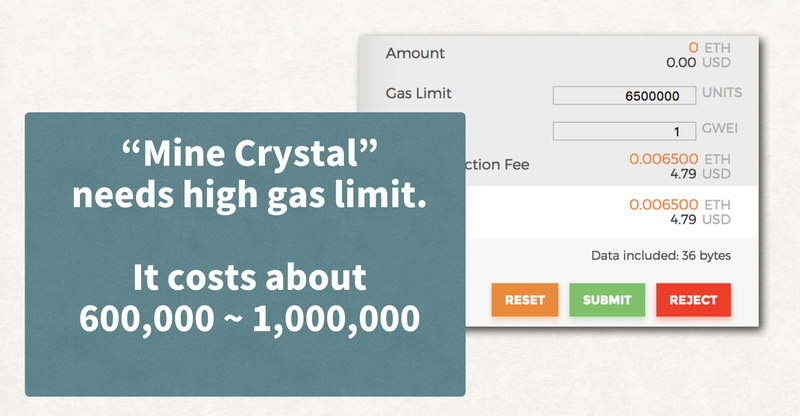 *Note:To create crystal needs high gas limit , please do not change this value because it will be out of gas , when the gas limit is short. Creation of the life always costs much, Did you know? Year! you can get the Crystals! 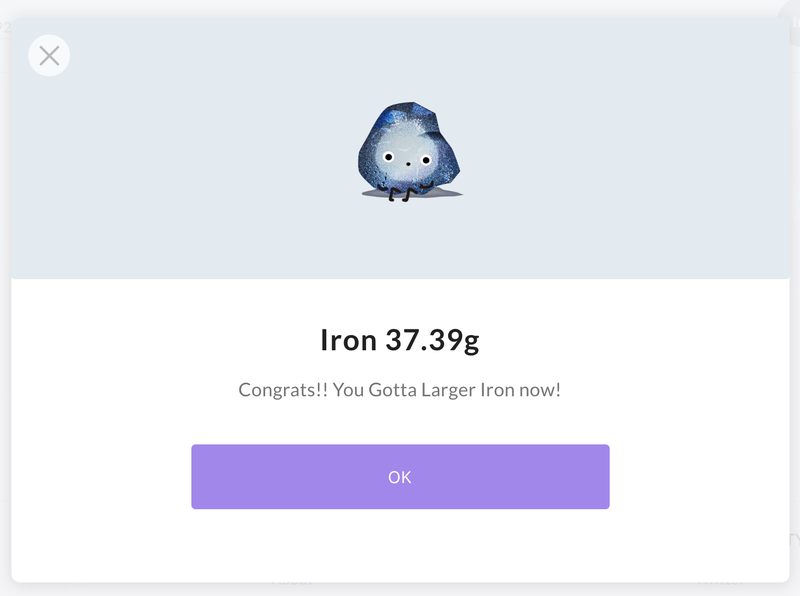 After pushing the button, you can check the status of mining with the popup at the right below. if the transaction is failed, then the status will disappear. 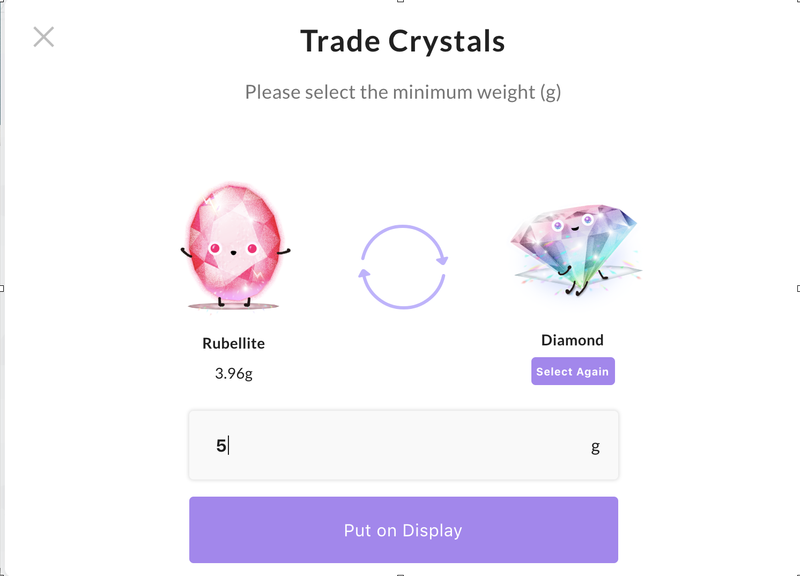 After it is changed as ‘Mine’ then you can check what crystals are mined.Please tap or click the What you got ,then popup is launched. By the way, Rubellite is very cute and rare crystal. Step 3 — Check your Crystals. Ok, Now you have mined crystals. Please check your “My Crystal” tab. 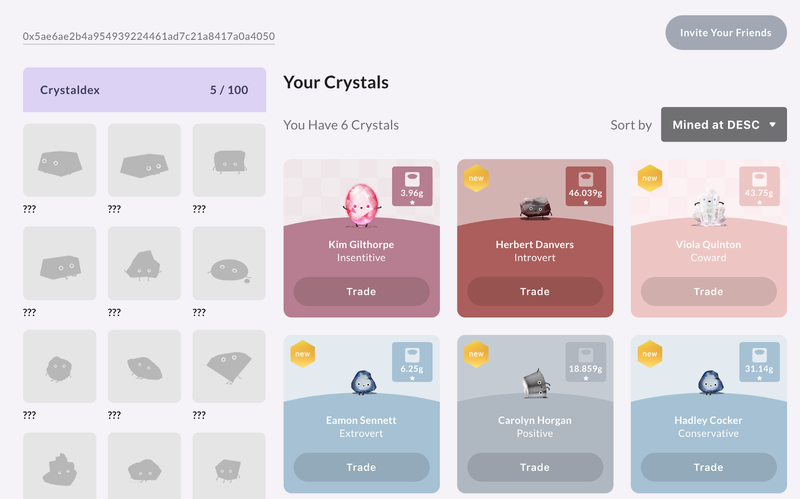 There are your crystals and you can put your crystals for trading. In addition, you can also check which one is new. 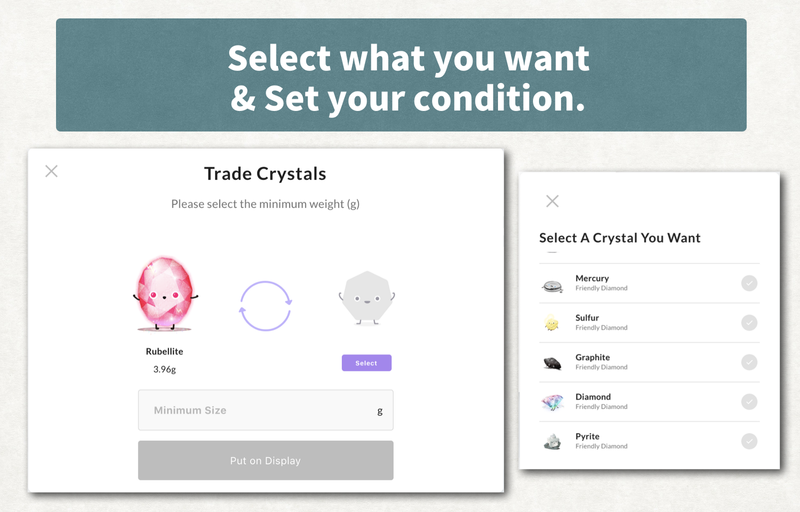 Set your condition to trade your crystal to what you want. I love Diamonds! I decide you! Step 6 Exchange your Crystal with others. Please look at the condition of the trade. If you have the crystals which suit to the condition, then you can bid it. Because you can only have one-to-one barter, it is important to have a strategy on what to trade. Let’s collect 100 kinds of crystals! In the world of CryptoCrystal, the symbol of wealth is always the size. Everyone needs the bigger one to exchange :). 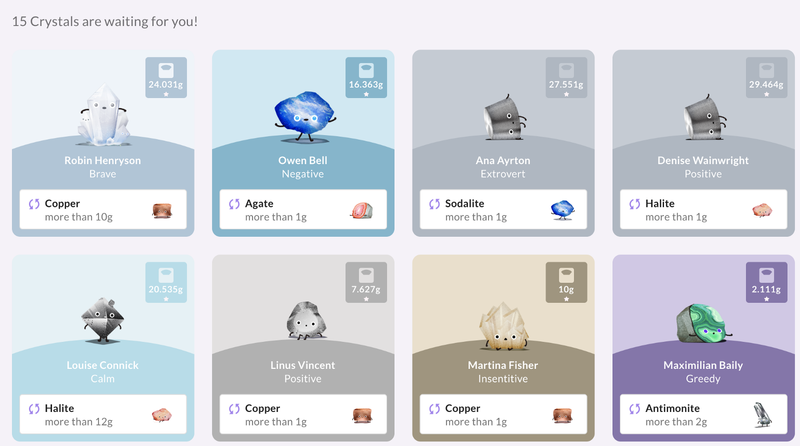 In order to make your crystal bigger, you need to collect more than two same kinds. Then you put them together with melting labo , and you can get bigger one . * Note:*Crystals in CryptoCrystal are designed uniquely. Each Crystal is given a unique gene, which you will never meet the Crystal with the same characteristic after the melting. You can check all your recent activities in CryptoCrystal here. At a glance , you can see your life with CryptoCrystal.